Organic, premium grade, caffeine-free, high mountain dried and crushed Jiaogulan (Gynostemma Pentaphyllum) leaf capsules – 100 x 500mg. 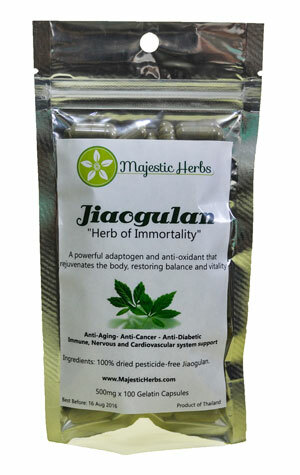 Majestic Herbs Jiaogulan contains no pesticides or chemicals of any sort. No chemical fertilizers are used in the cultivation process. You get pure Jiaogulan just as Mother Nature intended it – nothing more, nothing less. Perfect for people on-the-go who don't always have time to prepare a tea. Two capsules are approximately equivalent to 1 cup of tea. 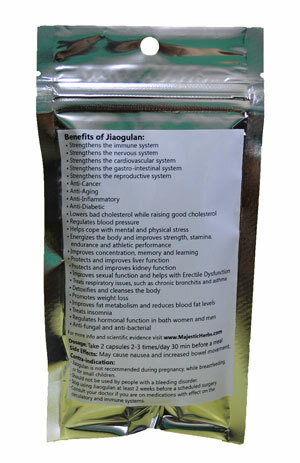 One pack provides 2-4 weeks supply of Jiaogulan for 1 person, depending on the dose. Buy 3+ packs for $16.99 per pack. Buy 5+ packs for $15.99 per pack (+Free Shipping). Buy 8+ packs for $14.99 per pack (+Free Shipping). Great Product, smells fresh. Will order again..
Amazing for energy and hormone balance! This product gives me energy and relaxes me. It arrived on time and was well packaged. Sensational nootropic and adaptogen. I’m seriously impressed with this lesser known herb. It significantly improves mood (has a restorative effect on the dopamine system) and enhances focus. Would HIGHLY recommend. I am very pleased with the capsules they help me move better with less pain. I will buy again. I have been taking the product now for over a month now and haven’t really noticed any changes that I can feel. Will finish taking it and revaluate it from there. Get our Jiaogulan ebook for free AND a 15% discount on your next purchase! 100% Privacy. We don't spam and we will never share your email address with a 3rd party. You can unsubscribe at any time. The statements made on this website have not been evaluated by the United States Food and Drug Administration. The information presented is not intended to diagnose, treat, cure or prevent any disease. It is intended for informational purposes only and is not a substitute for professional medical advice or treatment for specific medical conditions. Always seek the advice of your physician or other qualified health care provider with any questions you may have regarding a medical condition.